Shenley Primary School is located on the outskirts of London in the county of Hertfordshire and is a maintained school. Katy Longley has managed the grounds to provide the children with free play in the woods and forest school experiences to make dens, climb trees and discover their boundaries. The school has 270 pupils. Shenley Primary School is a Learning Away Champion School. In this case study, Headteacher, Katy Longley explains how their brilliant residential experiences start with stepping back in time. Shenley has a progressive residential programme where students can benefit from overnight stays in year 3 and 4 and then again in year 6. During the Yr 6 leaver’s assembly at the end of the academic year the main focus and memories are of the residential trip at Knapp House, as you can see from this piece of writing about one of our Year 6’s experiences written upon return from the residential. The Year 3/4 trip to Celtic Harmony Camp takes place over two days and one night, with an attending group comprised of 33 children and 5 adults. Celtic Harmony Camp transports pupils and teachers back to Ancient Britain and the costumed education officers guide schools through the Stone, Bronze and Iron Ages. 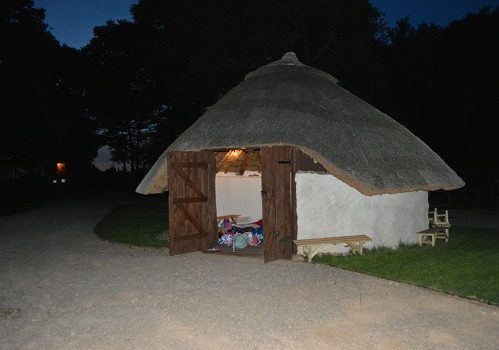 Pupils take part in activities such as: making flour on a quern stone; archery; woodland quests; mammoth hunting; soap knapping; warrior training; foraging; and trading. The gradual increase in length of stay with age is designed to develop students well-being, independence and confidence to deal with new and varying situations. The residential programmes are chosen to link directly with the national curriculum and bring learning to life through relevant safe and stimulating environments. How are your residentials integrated with the school curriculum and ethos? It is the school’s ethos to deliver a broad curriculum and give children experiences that they do not have access to at home. Residentials also give us a chance to slow the pace down to engage with hands-on experiences which provide a deeper subject understanding and an opportunity to develop relationships with peers. Taking this approach with children positively impacts classroom teaching when returning to school as a new level of mutual respect and understanding is achieved. How have you developed your residentials so that they are part of a progressive programme of experiences? The children start exploring their natural environment during forest school sessions and free play in the woods of the school grounds. Residentials are an extension of their outdoor learning journey, with the first experience of a night away taking place in a similar outdoor environment. This progressive residential programme enables children to take their first steps towards independence free from parental contact. They learn basic life skills such as organising their belongings, finding their own torch or pyjamas and tying their shoe laces, which are integral to the first stages of building up self confidence and independence. How have you designed your residentials so that they include a wide range of new and memorable experiences? We have selected residential locations and environments where the children do not tend to go in their free time. This creates unique experiences. We organize the trips so the children are responsible for carrying their own bags and deciding which group they wish to sleep with. Are your residentials inclusive and affordable for all your students? How do you ensure this happens? Shenley’s residentials are as affordable as possible so money is not a barrier. Parents are asked for contributions towards the residentials and we use Pupil Premium and apply for grants to ensure EVERY child that wants to go has the opportunity. How are your residentials supported by your senior leadership team? The senior leadership team considers our Brilliant Residentials to be a core part of students learning, often this is the time when the ‘non academic’ pupils have the opportunity to shine. As the Headteacher I lead all the residential trips and believe in giving the children as much free learning as possible to explore their environment and develop their relationships with others. Other senior staff members including the Parent Support Worker are a fundamental part of the residential team, ensuring children have opportunities to develop confidence and self-esteem and that the whole school is supporting the residential trip programme. How and why do you plan your residentials with learning objectives to meet students’ specific learning needs? When we are organizing our residential trips we consider the needs of the particular year group and tailor the programme and free time so that the pupils have as much autonomy as possible. We plan groups according to pupils needs and tailor make the activity plan and free time according to specific needs so that we reach our targeted outcomes. The children are asked to submit names of those they would choose to share a room with, giving them the choice to make and encouraging independence. On all trips the children need to take responsibility for their belongings. The residentials are chosen and planned to support the PSHE policies and ethos of the school. Children learn to be tolerant, overcome fears, supporting one another and engage in activities they wouldn’t normally have the opportunity to do. The residential trips are key to the learning and development of our children. Our school motto is ‘Take pride in your learning and your school will take pride in you’. How are your residentials led by teachers (and, where/when appropriate, students)? Teachers help to plan and select the venue according to the learning outcomes identified, which helps develop the pupil-teacher rapport during the visit. For example, our teachers co-planned the Celtic Harmony prehistory residential trip with the Centre’s team. Staff members are with the children through the daytime activities and the lead teacher is responsible for the pastoral care of the pupils during the evening, enabling informal activities to take place to build up the trust and rapport with the staff. Pupils take ownership of their residential by voting on what activities they would like to do and the food choices. How do you involve students in planning your residentials? Before the residential we meet with the pupils and give them choices about what they like to eat and which group they would like to be in. During follow up meetings we look at what the children have enjoyed during the residential in order to plan the next one. How are your residentials designed to allow students to develop collaborative relationships with peers and staff? The activities are chosen to develop team building, working as part of a clan to earn gold coins in the Celtic Harmony Warrior Day is a good example of this. We also aim to develop relationships and empathy and caring towards their peers. The residentials are planned at the start of the school year in Year 6, this helps to build the foundations of strong friendships, shared memories to make for a settled learning environment ready for the work ahead in Year 6. The children come back much more independent and ready to focus on their final year at Shenley. The children develop a great relationship with the staff and headteacher adding to their memories of the trip. How do you evaluate the impact of your residentials to ensure that they do meet those learning objectives? We evaluate the soft outcomes from the trip and are working towards a more structured evaluation in partnership with Celtic Harmony. At break on the first day and second days the children completed a pupil survey designed to measure confidence, wellbeing and attitude to learning, which allowed observation of how that changed over the two day one night residential. A slide show has also been produced as a reminder to the children and to give parents a feeling for their children’s overnight experience. The children’s enthusiasm and feelings of pride about what they have achieved on their own is a great measure of the impact of the residential. Celtic Harmony works with the University of Northampton to measure impact and the children stuck a happy, worried/confused or sad sticker on a board when they were met in the car park and on their way out in order to measure their feelings before and after their prehistory overnight stay. The 2017 impact report analysed the quantitative and qualitative responses of 187 teachers from 114 schools, including those of the residential stays. Teachers noted the experiential manner in which Celtic Harmony delivers an immersive learning experience, described as ‘a versatile, informative and authentic experience of the Celtic times’, which ‘required active participation’ and conveyed ‘the history of the ancient times in a manner accessible to the pupils’. Upon filling out post-visit surveys, 93% of pupils agreed with the statement ‘I enjoyed learning about the past through outdoor activities’, the other 7% were neutral. When comparing pre and post-visit surveys, 16% more pupils agreed with the statement ‘I do well at school’ following the Prehistory Residential, reflecting increased self-esteem. How do you try to embed and reinforce the learning once back in school? Years 3 and 4 stepped back into Ancient Britain at Celtic Harmony Camp in order to learn hands-on about Changes in Britain: Stone Age to Iron Age topic. The curriculum links to key stage 2 History, as well as the beautiful woodland setting and immersive nature of the attraction led us to our decision. The planning was enthusiastically supported by Celtic Harmony senior management, who visited Shenley to clarify and build upon the aims of the trip. The main aims were improved social skills and empathy, more historical awareness and increased independence, management of own equipment to name a few. Logistics and practicalities such as sleeping locations and eating choices for the children were also covered. After a 10am arrival and welcome from the costumed education officers, the children proceeded with their Stone Age Day. 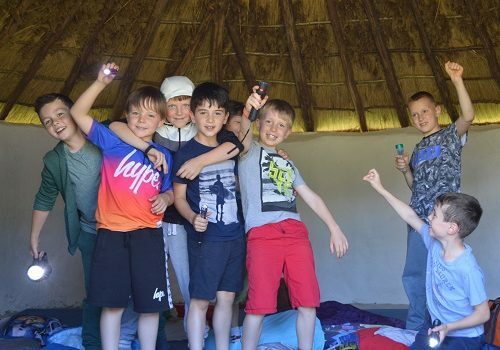 They were split into groups and proceeded with life as a Neolithic hunter gatherer as they experienced friction fire lighting, den building and mammoth hunting. After a packed lunch, children foraged for token mushrooms and berries and traded artifacts such as fur and horn. 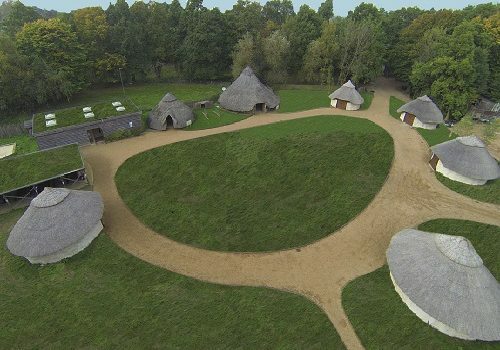 Later on, children were free to play and interact in the meadow whilst the roundhouses were converted into sleeping areas, following this it would be the children’s responsibility to unpack their sleeping bag and torch in girl/boy dormitory roundhouses to create a sense of independence. At 6pm, a BBQ dinner was provided, offering a range of meats including chicken drumsticks/pork ribs, potato salad, bread and vegetarian options. 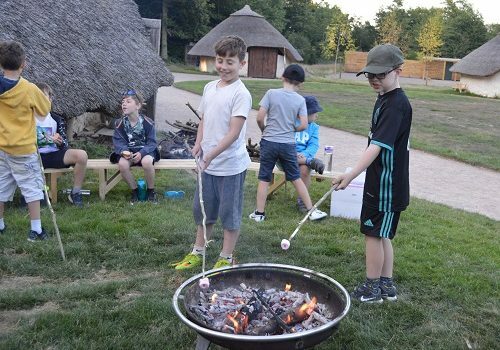 After dinner, children were again split into groups and rotated activities with some going out on a bat walk complete with bat detectors and some toasting marshmallows over the fire in the Chieftain Roundhouse. The following day, a continental breakfast of yoghurt, fruit, croissants and cereal was served at 7am. The Iron Age Day then commenced, including making rush headbands, archery in the woods, undertaking a woodland quest complete with clues, and a weaving challenge. At 3pm, the residential trip was complete, bringing the children back to 2017 to recount their Celtic adventures with their parents. The children learned to use flint to knap soap to make spearheads and went on a bat walk, listening to the bats feeding. These are all new experiences and opportunities to broaden horizons that our children wouldn’t normally be able to do. The children wrote about their experiences and drew pictures. They clearly had a better understanding of the history of the Stone Age following this trip. Parents commented on how animated the children were (albeit very tired) and agreed that the children had learnt a great deal and had thoroughly enjoyed themselves.